Are you looking for an answer on how to make it in the music industry? If you are like most musicians, you do not have any good solutions when it comes to building and developing a highly successful music career. Out of the vast majority of musicians who desire to become professionals in the music industry, very few reach high levels of long term success in their music careers. To really understand how to make it in the music industry, it is necessary to develop a successful mindset that will help you distinguish yourself from the overwhelming crowd of wannabes who will never become successful professional musicians. 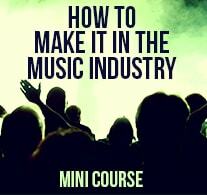 Get instant free access to the mini course that will help you to grow your music career. Simply enter your name and email, then click the "Give Me Access Now" button to enter. All of your information is always kept 100% private and confidential.